Standards revisions requiring more robust safety controls on fuel trains are just around the corner. Suited to both new equipment and retrofits of existing systems, these certified valves offer effective control, increased safety and put you ahead of the curve. 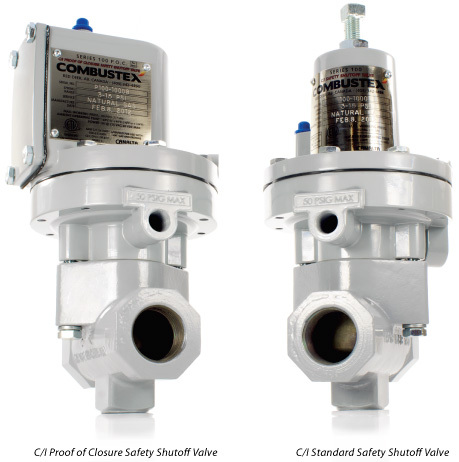 The Combustex Series 100 C/I Standard and Proof of Closure Safety Shutoff Valves are designed for safety and efficiency. The Standard Valve offers throttling (proportional) or on/off control of low pressure liquid and gas flow. The P.O.C. model serves as a main shutdown valve and provides additional verification of valve closure through an electrical switch. These “fail-closed” valves were specifically developed to be C/I Safety Shutoff Valves in compliance with CSA B149.3-05, CSA 6.5-05 and ANSI 21.21-05, meeting or exceeding the requirements for safe operation of fired heaters. 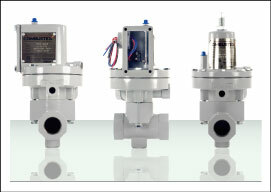 With tapped vent ports, sealed spring cases and HNBR sealing components, the Combutex Series 100 C/I Standard and Proof of Closure Safety Shutoff Valves are designed and approved for use with either air or natural gas as the diaphragm operating medium. These valves are capable of effective operation in a wide variety of applications and industries where on / off control and a positive seat seal are required. A uniquely designed diaphragm assembly on the P.O.C. model allows over-travel after valve seat closure to provide true proof of closure. The explosion-proof SPDT dry contact switch provides either normally open or normally closed action for control purposes. These features enable the valve to provide high flow and full bubble-tight shutoff over the complete pressure range of the valve. Optional materials are available for NACE MR-01-75 compliance. Actuator disassembly is not required to service the process sealing components. The valve plug, cage and seat sealing components can be easily accessed simply by removing two body bolts. Compact, lightweight construction permits installation in close quarter applications. With double block and bleed designed packaging, process fluids cannot weep into the actuator cavities or vice versa. The actuator diaphragm, seals and spring case are designed to allow for use with air or natural gas as the actuating medium. All vents are tapped 1/4” NPT, enabling leaked control gases to be piped away to a safe location. With a brightly colored indicator, the position of the actuating diaphragm provides the operator or service technician an easy guide to the position of the valve plug.